Nature's Sleep Slippers I have been wearing these slippers for about a week now and I love these they are so comfortable your feet just sink into them. These would be perfect for the hospital when having your baby or really any stay in the hospital. I know I wish I could of had these then. If your looking for a good set of slippers look no further. The color I was able to review were the pink ones which are perfect because that's my favorite color. Nature's Sleep designs products for comfortable, healthy, harmonious sleep. Our memory foam products cradle your body in perfect balance, providing gentle support and relief throughout the night. We offer products that use organic and hygienic materials that nourish your well-being, so you wake rejuvenated. * Genuine high density Memory foam Insole. * Solid durable outer sole. * Available in a verity of assorted colors. * Material can be spot cleaned or washed. * Size from extra small to extra large. I would have to say I choose these before any other slipper these are so nice. Ok now for the giveaway. Would you like to win a pair of slippers?? You have 2 choices open toe or closed toe. Follow the Rafflecopter below to see how to win. I would pick the closed toe in Pink. 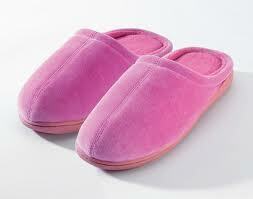 I would like the Closed Toe Terry Slippers w/Memory Foam in Sand. I would like closed toe in pink! I would choose the closed toe in Pink.